Subscribe to flight deals and book a cheap flight ASAP. Ale has a quick eye for this one! She is subscribed to email alerts from various airlines including: Alaska Airlines and Southwest which usually have the best deals. So as soon as Ale got her email from Alaska Airlines featuring $297 round-trip tickets to Maui per person - which usually run from $380 - $570. We put our coins together and booked it ASAP…like within 24 hours, aah! Mind you, we were still furloughed employees at the time and had no idea when the government would be back in business, so we really took a gamble. It ended up being the best last-minute decision we made. Find a place to stay and split the cost. Woooo! So we were set to go to Maui.. but didn’t have all the details lined up, so next was where to stay. As we told y'all earlier, we booked our tickets during the furlough meaning we had no extra money to book anything else at that time. We all began researching affordable places to stay and keeping track of what we found to compare. We checked Hotwire, Airbnb, Expedia, and Hotels.com, and quickly found out how expensive Maui is….. Airbnb's and hotels were listed for over 2,000 dollars for our 5 night stay... ouch!! And as the days passed and the government hadn't passed a resolution, we began to get anxious that we wouldn't be able to book a decent place at a good rate. But we took a breath, kept the faith, and put out vibes into the universe for the best place that could accommodate all of us and that we could afford. And just like that Airbnb delivered! A 2 bedroom, 2 bath apartment was available in Kihei close to the airport, beaches, shops, etc for 1365.00!! Hell yes! Thank goodness for Airbnb's Pay Less Upfront method that allowed us to pay half upfront to book it and the other half a couple weeks before the trip. We were able to breathe a sigh of relief knowing we had a place to lay our heads at night. Our Airbnb ended up being exactly what we needed and was literally a 3 minute walk to the beach. Create an itinerary of cheap activities. Through the years we’ve loved using the Roadtrippers app and Pinterest to make itineraries of our trips or bookmark places to visit in the future. Roadtrippers is a free app and website that allow you to breakdown your trips by day and locations. It's literally a map, so you can mark all your stops to see how far attractions, restaurants, etc are from each other. It even tells you approximately how much money you'll spend in gas! Another cool feature are the tools with filters to help suggest different spots like ‘points of interest’, ‘food & drink’, ‘outdoors’, ‘things to do’, and more, perfect for finding those hidden gems. Pinterest is where we create our virtual vision boards. We use this app to plan parties, vacations, ideas for DIY's, and more. As soon as we booked our flights, Ale started a Maui board and sent us invites so we could all pin ideas to it. We found beautiful sites like Iao Valley State Park and the Road to Hana. Ale also had pinned Kehena Black Sand Beach years ago and even had it on her vision board forever, so we made her dream come true of digging her toes into the black sand. Creating a trip itinerary is super helpful so that each day has a set plan and you can avoid the what should we do today? I don’t know what do you wanna do? infinite question loop.. which may waste precious time. It's super helpful for everyone; folks who crave organization and structure and those who hate having to make decisions on the spot. It may also avoid stressing over the overload of things to do and no time to do it all. You can pick your top not-to-miss things to see and plan your days that way to have your trip go as smooth as possible. Keep calm, and carry on.. luggage that is. Packing can be super stressful with all the pressure to meet TSA requirements, while still trying to find the right outfits to bring… Whether you're like Ale who creates lists of what each person in her family will need and then meticulously packs it all to make it fit or if you’re like Mariajosé.. waiting to pack at the very last minute and trying to squeeze additional random items you might possibly need but in the end don’t even use. Keep calm and just take your carry on! Don’t check in bags unless you absolutely need to. In past trips, Ale and Mariajosé have checked in one suitcase they shared which had their clothing and shared toiletries, which worked for their longer international trips. If you can, do your best to fit everything in your carry-on to avoid those pesky baggage charges…. That's money you can use to buy yourself a yummy treat instead! 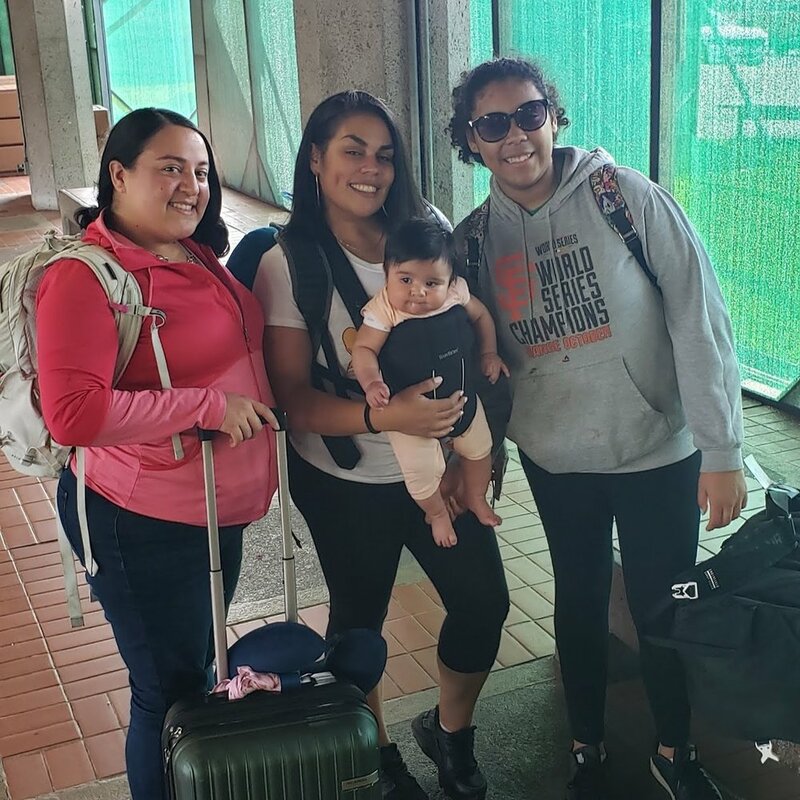 For this trip, Ale and Cesar only checked in Baby Anaís’ essentials which could not squeeze into a carry on - baby car seat and full sized liquid items like baby formula, etc. One trick they used was ordering her baby formula online from Target and picking them up in-store upon arrival which saved a ton of packing space, but could also work for other items you may need. It also saves you money because items you buy online at Target are cheaper than in store prices especially those located in touristy areas. Whew! Now that we were all packed and ready to go, the next obvious question is where to eat tasty local food without breaking the bank. Plan your meals and pre-pick the foodie spots you want to try. Ok, so this is definitely Ale's favorite part of planning any trip as she is a self proclaimed foodie and will plan any outing big or small around the food spots nearby. Here's how we go about it, in the time leading up to the trip we all search Yelp for places that are A. affordable and B. tasty! We also check hashtags on Instagram of foodie spots at our destination, and choose our must go to places that way. Lastly, ask friends and family who have been before, they'll be happy to give you suggestions. We're glad we asked! Because we were going to be in Maui for an extended amount of time, we also planned to buy groceries and cook some meals at home to save us some dollars (food in Maui, while super yummy and served in huge portions can get expensive when you're feeding a family of five). Before leaving for our trip we sat down and made a menu of meals we could cook at home. When we arrived in Maui, our first stop was to load up on groceries for the week. One piece of advice we'll offer in retrospect is don't buy too much food, because you'll end up wasting it in the end. Buy enough for a few meals, you can always go back to the grocery store and buy more food. The truth is there is so much yummy fresh food in Maui that you won't want to miss out on. It's worth the splurge…. Trust us on this one (look out for another blog soon on our favorite spots to eat in Maui). Maximize your beach time, that’s mostly why we went to Maui in February right? It’s free and it’s perfect for the whole family. We made sure to get out on the beach every day, whether it was at the beach close to our Airbnb, or a drive to another scenic beach on the island that offered different views, sands, wildlife sightings, or cool natural features to search for. Each beach had its own treasures, but some of our highlights were: catching sunsets and seeing a sea turtle at Charley Young Beach in Kihei, whale-watching at Kaanapali Beach in Lahaina, the black sands at Kehena Beach on the Hana Highway, and finding a heart shaped cut out in the coastal rocks by the Nakalele Blowhole in Wailuku. Even Tuti, our little Anaís lived out her Moana dream, dipping her toes and fingers in the sand and water. Well there you have it, all our tips, tricks, and secrets to going on a dream trip to Maui while on a budget. It can be done with some planning, a lot of budgeting, and a little faith. So stop putting off that vacation and go for it! And then let us know how it went, and if our tips helped at all.